Sit down, buckle up and hold on tight. From sinister speed to uncompromising control, the Dodge Challenger is breaking through the limits of performance. Project 6GR wheels made it possible to bring you guys the widest setup available for any Challenger / Charger. We call it the Mopar setup with a 20×10 20MM Front and 20×11 20MM rear. For the regular non brembo brakes we offer a RT / Base setup sizes 20×9.5 Front and 20×11 Rear. Project 6GR wheels offer 3 different styles, Our signature wheel style is the Project 6GR 7-SEVEN inspired by the GT350R Carbon Fiber wheels. Secondly the Project 6GR 5-FIVE makes any Muscle car stand out from the crowd with its 5 bold simple spokes. Lastly our newest edition to the 6GR wheel line our new 10-TEN spoke design, providing the ultimate 10 multi spoke design while keeping a masculine look. 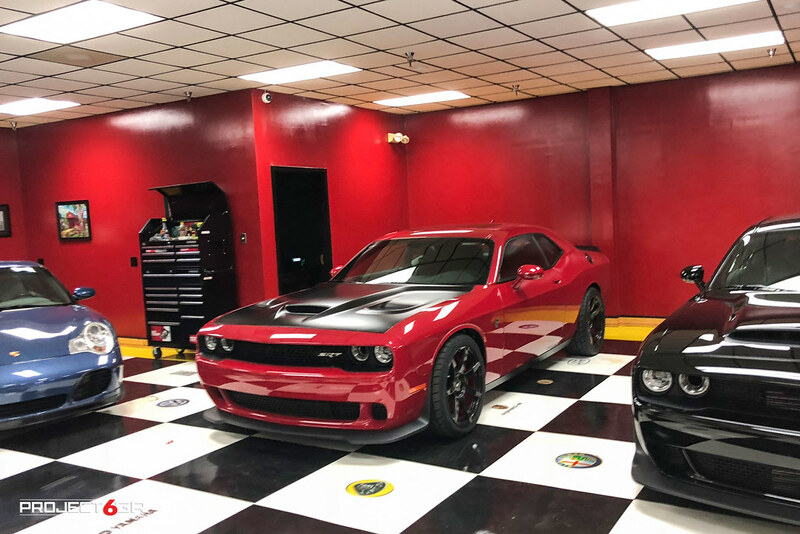 This is what we call the “perfect setup” for this Hellcat below sporting the Project 6GR 7-SEVEN in 20×10 20MM Front & 20×11 20MM rear wrapped with Michelin Pilot Sport 4S measuring 275/40/20 Front and 305/35/20 Rear . The Michelin Pilot Sport 4S is an Ultra High Performance street / track tire that provides a blend performance of ride comfort and quality. The all new Spun Forged Project 6GR 7-SEVEN in Carbon Fiber Hydro Dip makes a perfect color combination and shows off those massive carbon ceramic brakes. Proudly Project 6GR wheels offer direct fitment for the Challenger / Charger meaning you won’t be needing Hub rings or spacers. The Project 6GR wheels have been specifically design to be Hub centric eliminating any vibrations while on the road. Challenger below sporting 20×10 275/40/20 Front and 20×11 305/35/19 rear.